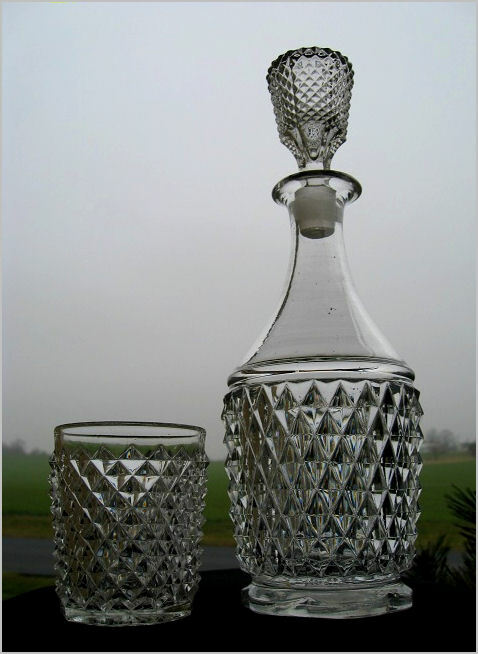 Antiques and especially glass are the easiest and least costly collectibles to acquire if you know what to look for. If your wallet isn’t big on cash, simply adapt by having your wits about you. A little luck always helps; being in the right place at the right time, and that luck you can create yourself by being persistent. Frequent your local Goodwills, Salvation Army Thrift Stores, as well as any other Thrift Store, Flea Markets, Yard Sales, even Antique Stores and Shops, as not everyone knows what they have. There are no hard and fast rules. Deals are where you find them. 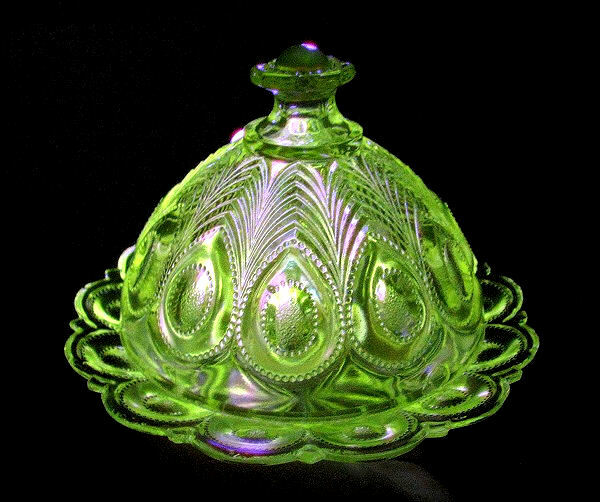 Featured below are some amazing examples of antiques and glass acquired simply by patience, persistence, right place at the right time, and, well, a bit of antique knowledge helps too. 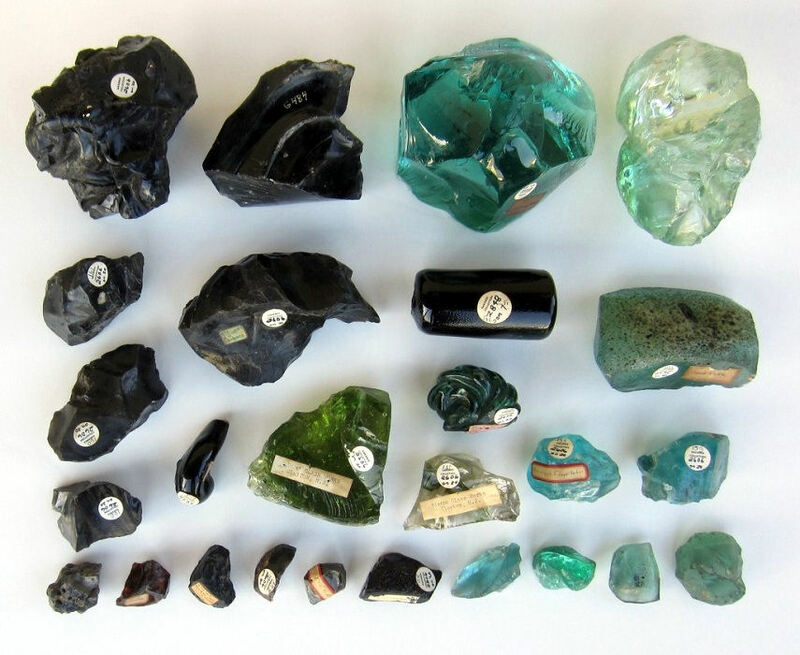 In January and February 2013, I managed to acquire from two different glass dealers in two different towns, from the entire 1975 Skinner’s auction, Charles B. Gardner Collection, Lot #2606, and an emerald green color block from Lot #2848, and various other Gardner Collection items from the early glasshouses from 1750’s to the 1890’s. These glasshouse slag pieces came from every glasshouse you could imagine. See my March 2nd, 2013 article 1975 Skinner’s Auction Lot # 2606 of the Charles B. Gardner Collection Reunited at the Farmhouse. Also see Vol. 4 No. 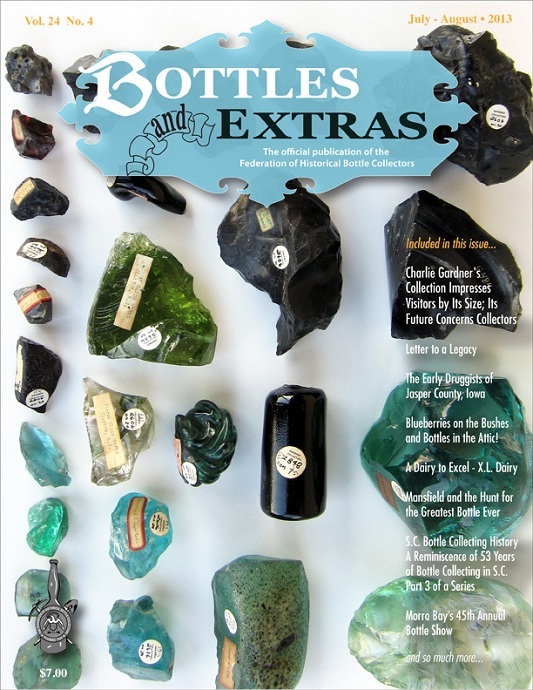 24 July/August Edition of Bottles & Extras, The official magazine of the Federation of Historical Bottle Collectors. This is a Consolidated 138 W. Brookfield POSTAL TEL Co insulator I picked up at a local community yard sale for ten dollars. 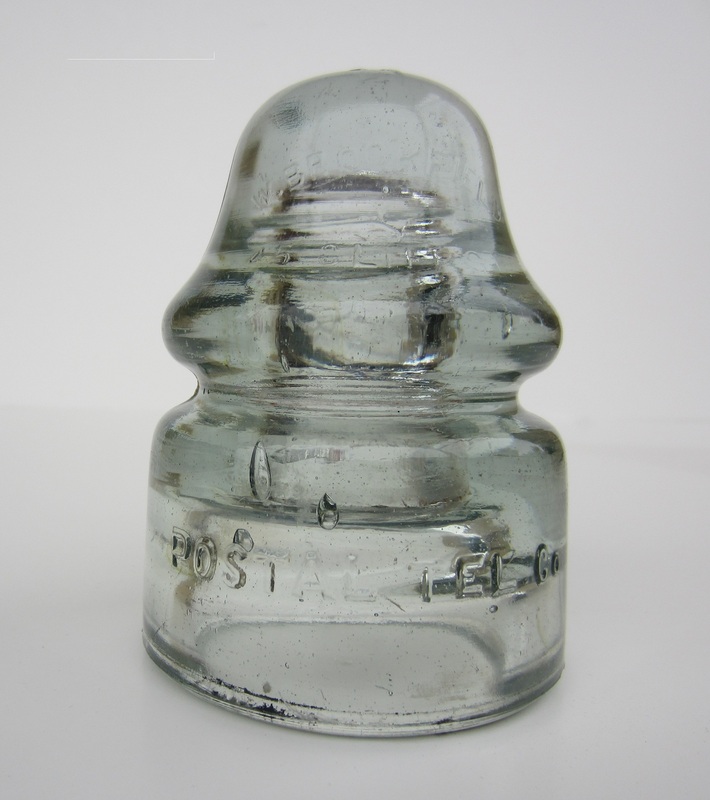 I was all too familiar with Brookfield insulators, but not ones referring to the words, Postal and Telegraph and the Brookfield address at the top along with the Patent date of 1872. And, seeing that much, then there was the color, a “dishwater gray-blue.” I tried to get it for five dollars but no go. So I thought it can’t be a loss, it has to be worth more than $10.00. It was. I listed it on eBay for $9.99 and it ended at $876.00. That’s pickin,’ but it doesn’t happen every day. You won’t hear any complaints from me. This is a beauty and quite a mystery. I have yet to identify the maker and what it was named and why it was made. The eagle is fantastic and there’s 13 stars in the inside portrait surrounding it to signify the original 13 colonies. There are 6 stars on the outer border. Very thick and heavy for it’s size, it is one of my favorite cup plates. 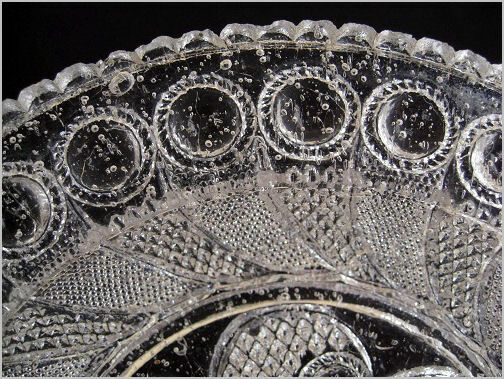 See my January 2013 article: Glass Cup Plates Full of History and Mystery for more on this piece. What a Lady. 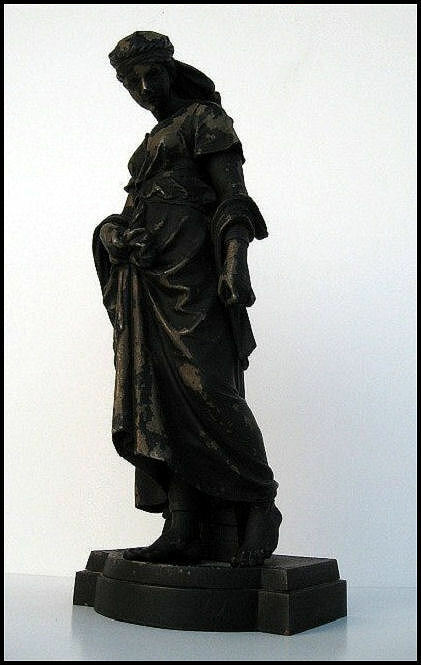 The humble and yet proud and graceful poise; the aged look of time in her patina. I could go on and on, but I’ll let her speak for herself. She likely dates to the latter 1800′s. I found her many years ago in Florida for a mere $10.00 and have never seen another representation of her. 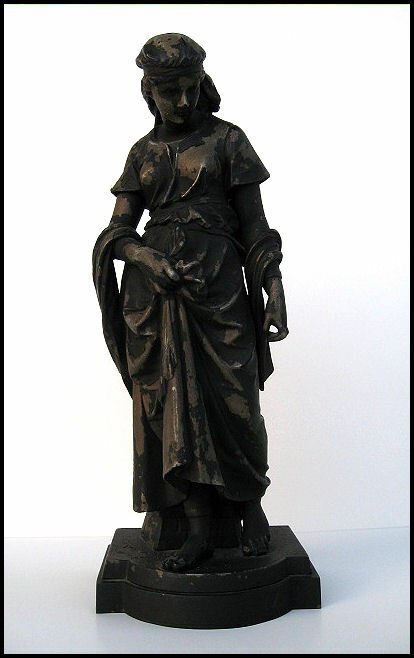 She is unsigned, stands 15″ high and is made of mere pot metal and the original black paint is age worn to perfection. I should research this piece as it may be a representation of a famous work by a famous artist. I have no idea of her value, but to me, she’s priceless and may as well be made of gold. Like I always say: A deal is where you find it. So is beauty. 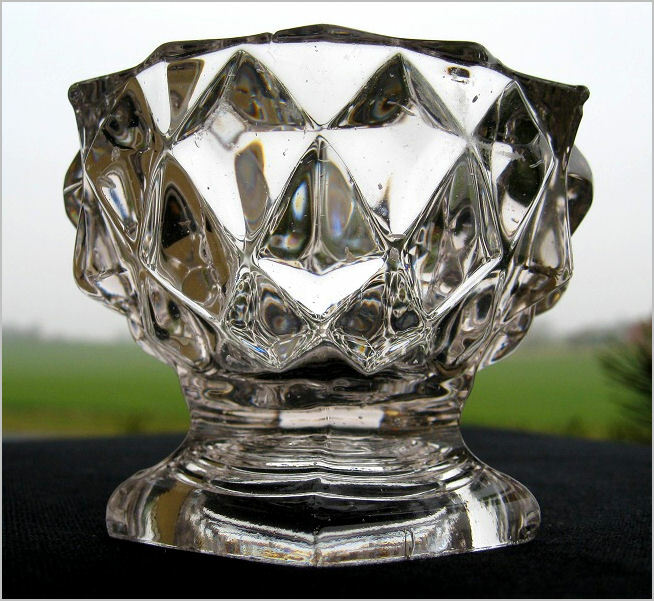 This is a stunning, elegant 1830-1840′s Flint Glass Open Compote with quite the primitive masculine pattern called Giant Sawtooth, which is one of the earliest patterns in American glass history. Origin of manufacture is attributed to the Pittsburgh area Glasshouses, very likely Bakewell Pears. It’s large, very heavy, and quite the eye pleaser. The lead flint content is so pure, that when tapped it rings a beautiful tone for most of a minute. Stands 7-1/2″ high and is 7-1/4″ top diameter. The condition is amazingly perfect, which is extremely rare for a piece this old. 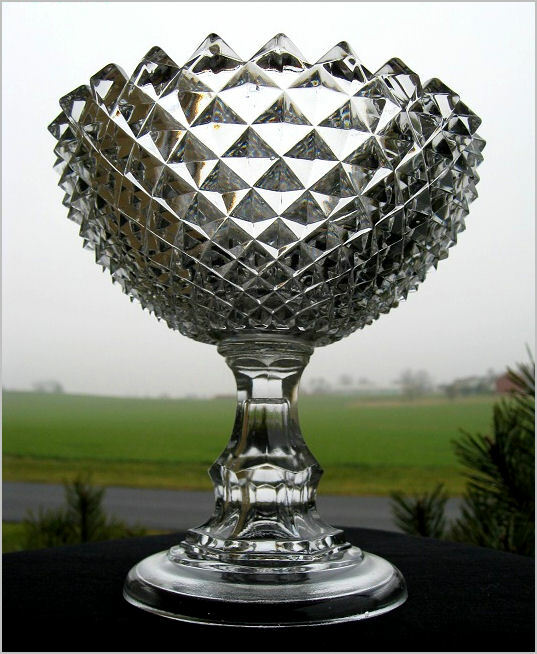 Most interesting is the very primitive method of creating this magnificent compote. It was molded in two separate pieces and crudely assembled. What you’re seeing above is the gloppy wafer slab of molten glass used to connect the top and base. I find it amazing that such a elegant piece was so crudely hand crafted. A very impressive and very early piece. This isn’t an easily found pattern, and finding a combination of an opalescent top coupled with beautiful hand painting in gold and red was very surprising. 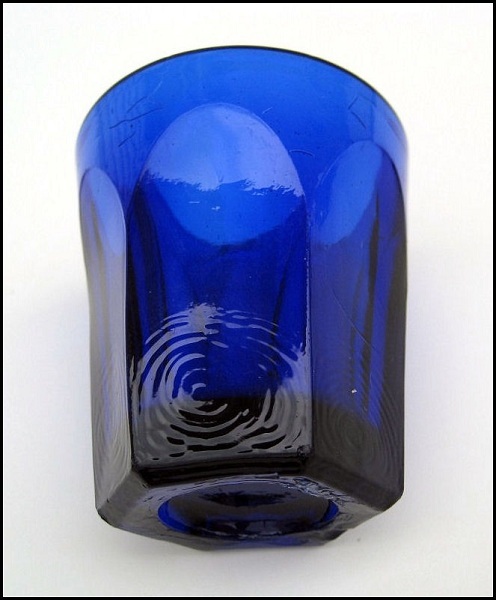 This 4″ high Northwood Alaska Pattern tumbler in blue glass is an absolute beauty in perfect condition. I never expected to see this in a Salvation Army store three days before Christmas along with another amazing Peacock Feather piece featured below. There’s nothing like pickin’ and ending up with both hands full. 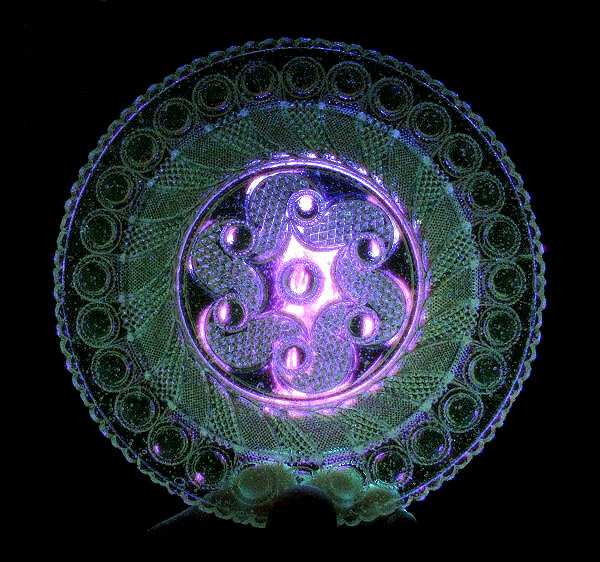 To find two uranium content pieces that glow green blacklighted, despite this being blue is amazing. This really knocked my socks off as I spotted it down on the bottom shelf while already holding in my hand the beautiful blue tumbler featured above. This was a great day for picking. For the whole story, see my December 2012 article Two Old Peacocks Still Struttin’ Their Feathers. 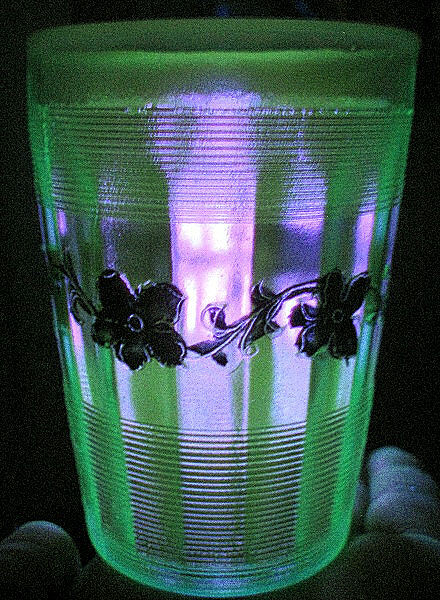 The uranium oxide in the glass makes it glow green under a blacklight. An amazing score and a lovely piece. This is something George Washington would have drank from. 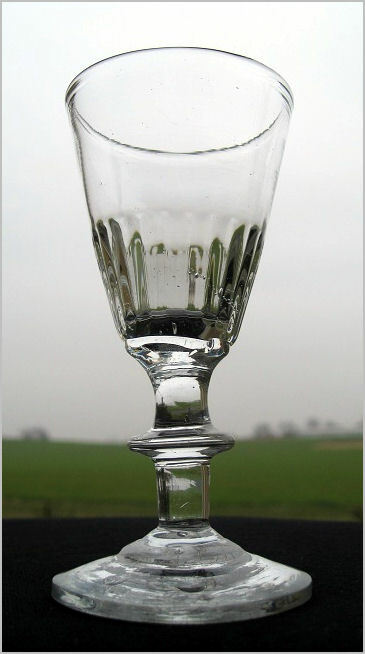 A very early and gloppy-crude wine glass. Note the elegance with the fluted pattern on the cup. Also note what a primitive piece this is; made in 3 parts, the cup, the stem, and the base. All were blown and pieced together. The ‘knop’ at the center of the stem was to give strength to the weakest point. 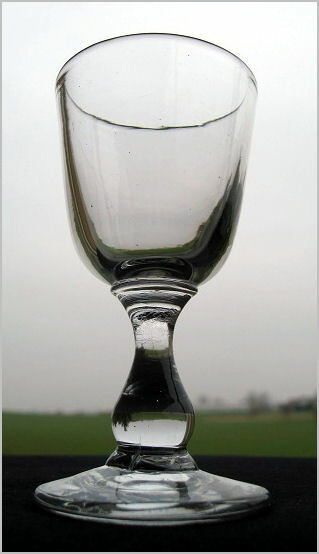 The whole glass appears to stand straight, but look closer at it’s individual parts and notice the ‘waver’ to the whole piece. It could actually be earlier than 1780, but it’s definitely that era. Note the very rough pontil on the base in the second picture. 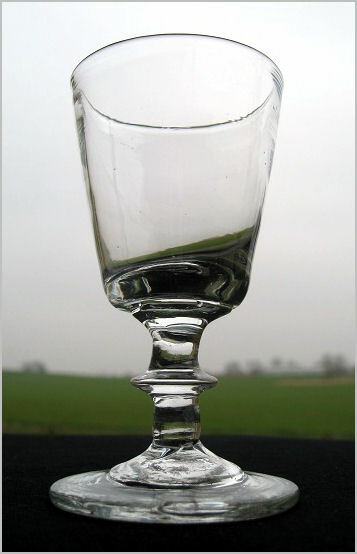 These knop stem wine glasses are extremely hard to find with a pattern. This is definitely a keeper. 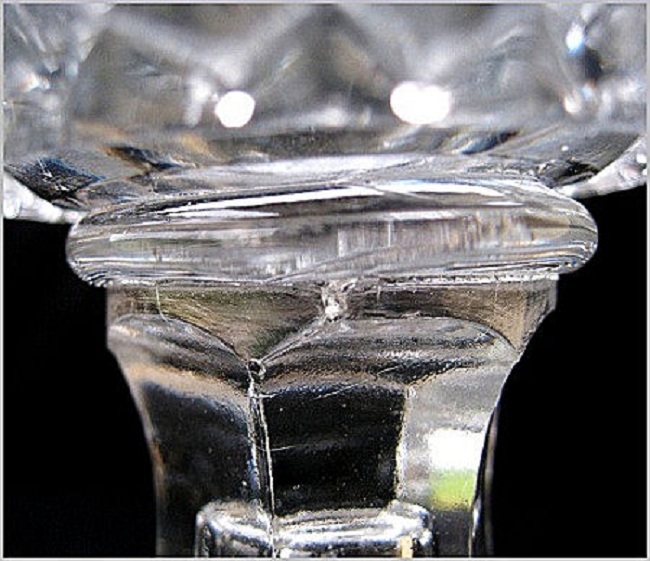 This is the more commonly found early knop stem as it was the basic, all around style produced by many glasshouses during that time. Just plain and simple, but no two are ever alike. 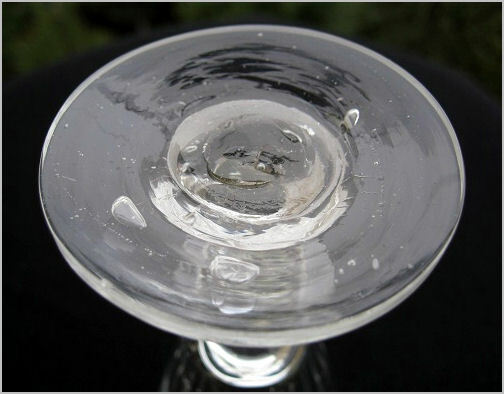 This one is a favorite due to the two very large bubbles in the base. I run into these in antique stores on occasion and the full value prices are always the same. 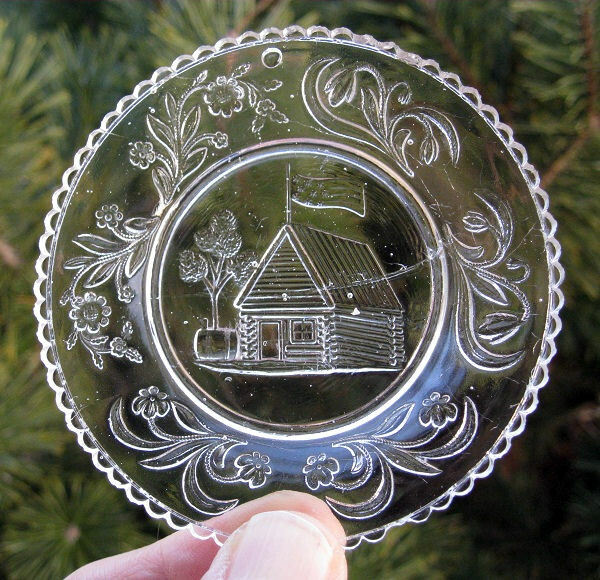 The lead flint glass rings like a bell. An oldie and a goodie. This is an unsual example and I was very surprised to pick it up. Even with the Goodwill 47 cent price tag covering the polished pontil on the base, I knew it was a nice piece. 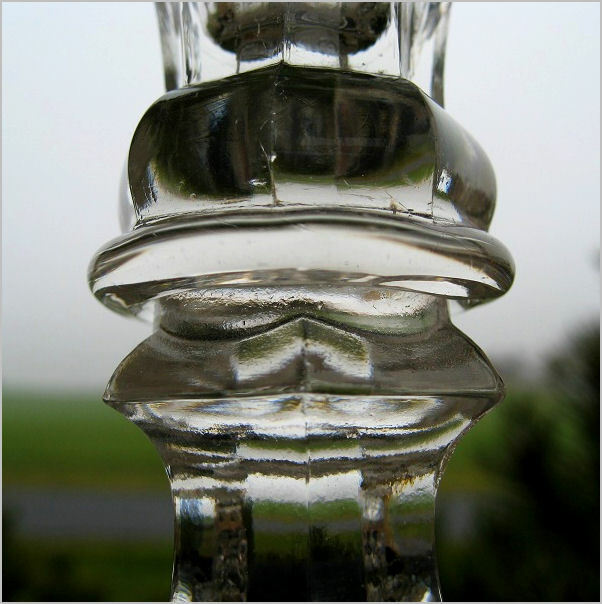 The stem is called Balstrade, it’s like a teardrop. This was made in 3 pieces like the examples shown above, however the maker ground, or polished out the rough pontil on the base and now there is a concave indent. 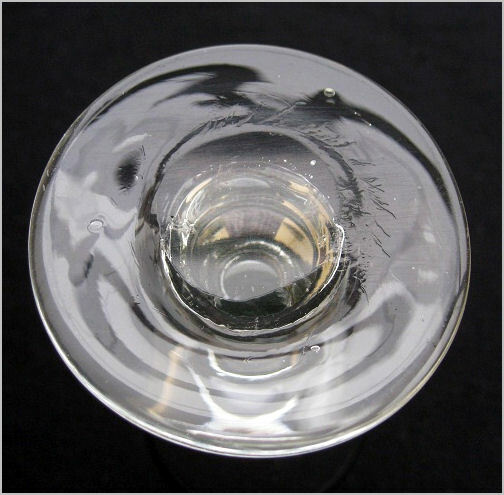 It certainly wasn’t all polished out, as you can see, even with the polish of it, the base and whole glass are primitive and crude. This and the above two are used occasionally here at the farmhouse when yours truly likes a glass of Port. That’s one great thing about most quality antiques, they were built to last and they still work. Cheers! This is the only one I’ll ever see like this. A very purple and very early, thick and quite heavy, ringy flint glass bowl. In my research, I’ve managed to attribute this to Boston & Sandwich Glass Company. The rayed base and the quilted diamond pattern definitely gives the nod in that direction. It weighs at least 2 pounds and is much more purple that my camera shows. For the whole story, read my December 2012 article: A Rare Second Chance and the Color Purple. A very impressive and primitive piece. This is a rare little piece of history. The theme behind the Harrison campaign was a log cabin and barrel of hard cider. This theme was actually taken from an editorial insult in a Baltimore newspaper. Harrison ironically took it and used it to his winning advantage. He was the 9th President, and died after serving only 30 days and 12 hours in Office. 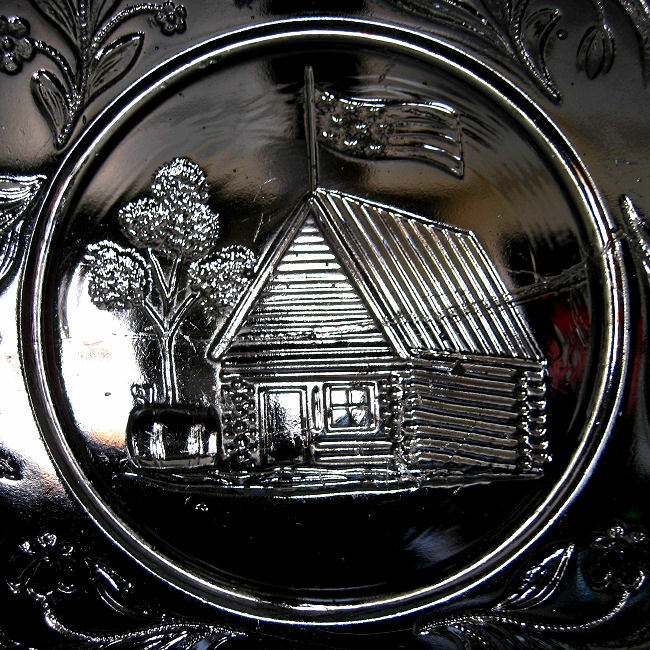 This gem of an 1840 cup plate was made by Boston & Sandwich for his campaign. 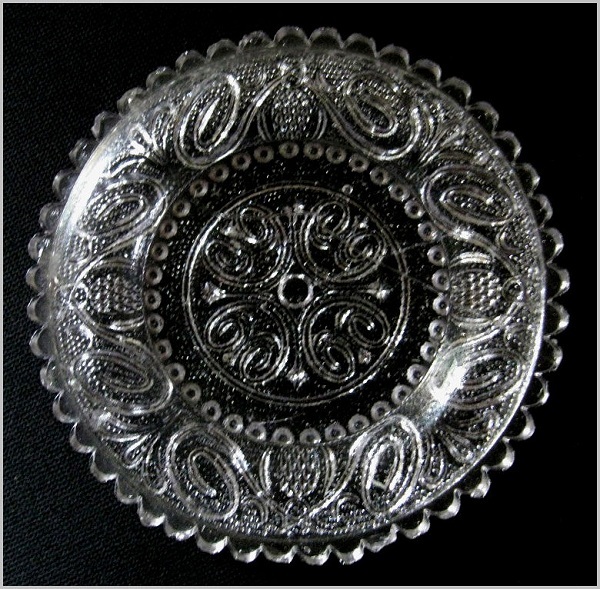 See the full story in my January 2013 article: Glass Cup Plates Full of History and Mystery. This is another classic example of a simple stroll through a Goodwill and scanning the glass shelves for anything old. It wasn’t hard for me to spot this beauty. 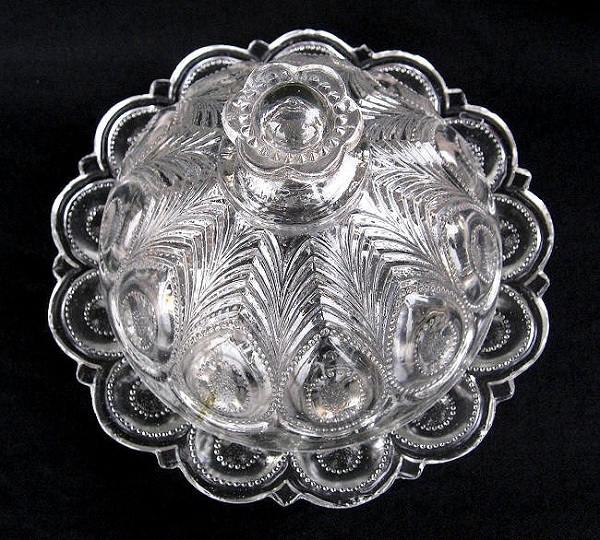 This falls in the antiques category EAPG, which stands for Early American Pattern Glass. This is a more stunning piece than normally seen as an EAPG example. The border is comprised of two EAPG classic patterns: “Daisy and Button,” and “Barley.” The center is beautifully impressed and the acid etched scene titled “The Warrior,” is artist signed PJ Jacobus in the lower right by the rock. 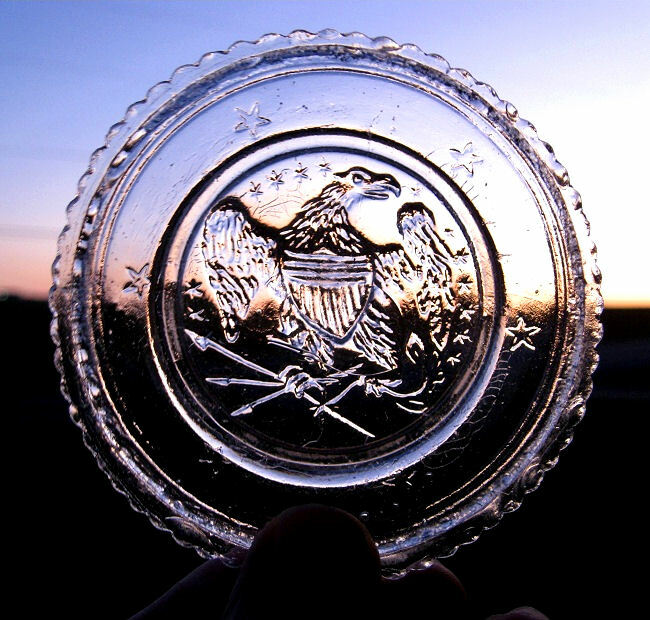 It’s quite a large plate and is a whopping 11-1/2″ diameter. 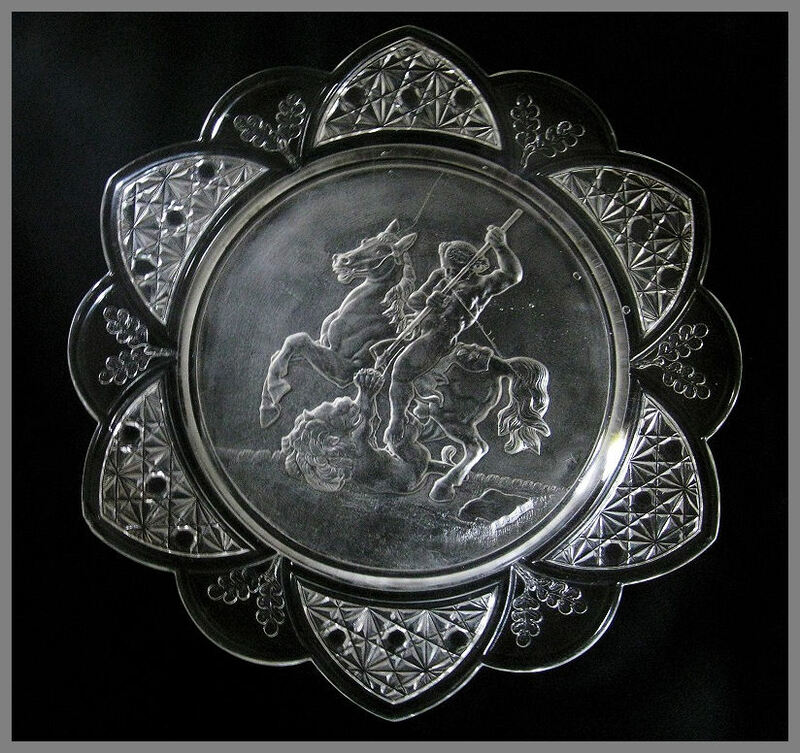 What appears as scratches from the warrior’s chest to the horse’s tail and above the warrior’s head are “glop” wrinkles in the glass which was common in these mid to latter 1800’s pressed glass pieces along with bubbles and adds character and does not detract the value or beauty of the piece. This bizarre 5″ medallion I found in a Goodwill in Florida even has the manufacturing company owner mystified as he didn’t keep records as to who may have commissioned it. (I am not far and took it to show him in my research.) It commerates the massacre of “Bugs” Moran’s men in Chicago on Valentine’s Day in 1929. Note the dead bodies and the man with a Thompson machine gun. 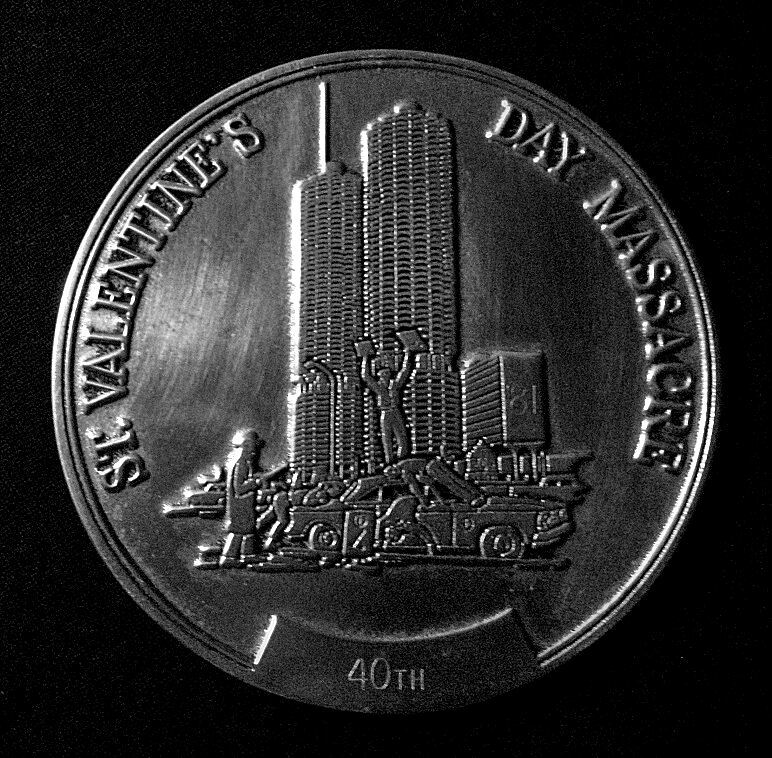 See my November 2012 article: The Mysterious St. Valentine’s Day Massacre Medallion for the story and mystery behind it. A very unsual collectible. This is from a stop at the same Goodwill. (If they see this page they will probably ban me from the store, first chasing me out with a large stick 😉 . This is a terrific tipsy tower of 1860’s Civil War era flint glass. This lovely and crude candlestick is heavy and much larger than my picture illustrates. 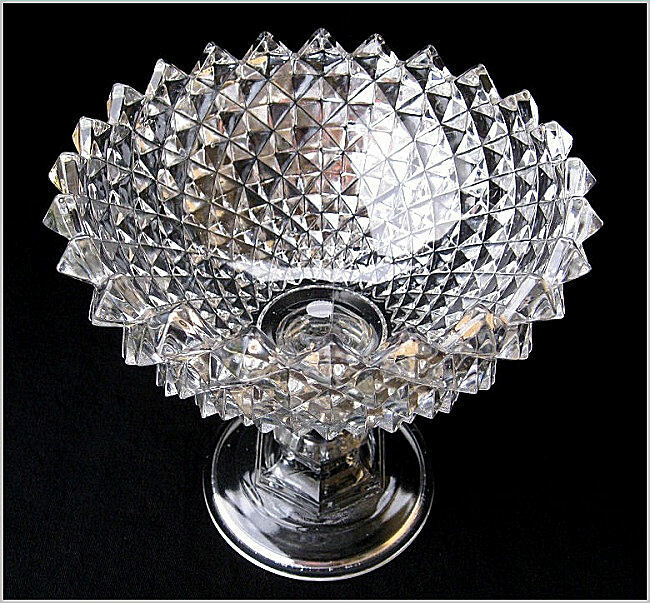 The height is 9-3/4″, the base is 5″ diameter. This was standing crookedly proud on the top glass shelf display. I instantly noticed both the early style and it’s lean at the same time. It has Pittsburgh glasshouse style written all over it. The making is interesting. The base and top are 2-part molded, but the center knop on the triple knop stem has a rough area around it, so the mold may be a 4-part, (or technically a 6-part.) Definitely a winner of a gloppy, early piece. The heavy top had tilted during the annealing, or cooling process. 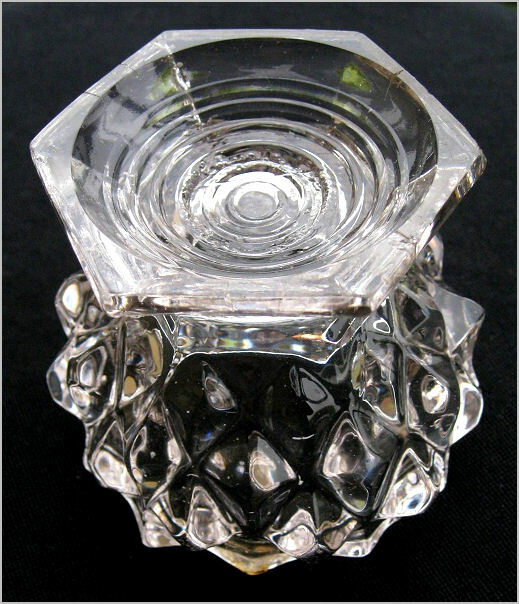 A pewter insert in the top held the candle. I was quite amazed to pick this up, especially in attic condition. 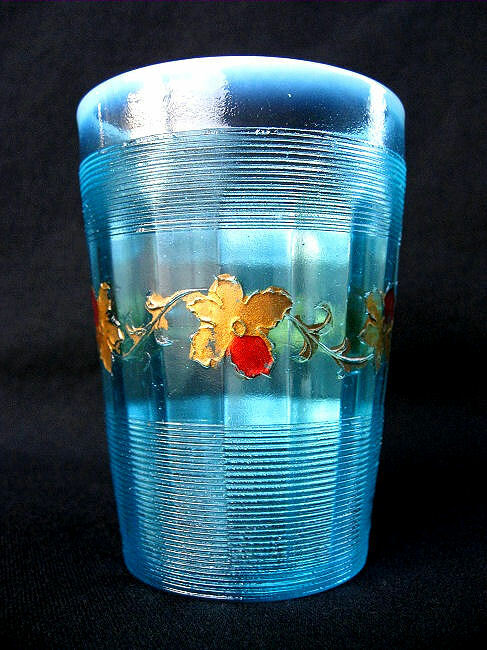 This is quite the oldie and goodie, a beautiful 1850’s cobalt flint glass whiskey tumbler made in a Pittsburgh area glass works. The lead flint makes it heavy and ring like a bell when tapped. 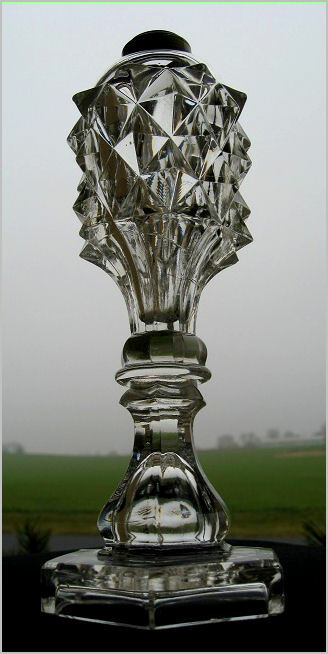 This is a class act for a sip o’ whiskey; elegant fluting, yet very primitive in it’s manufacture. 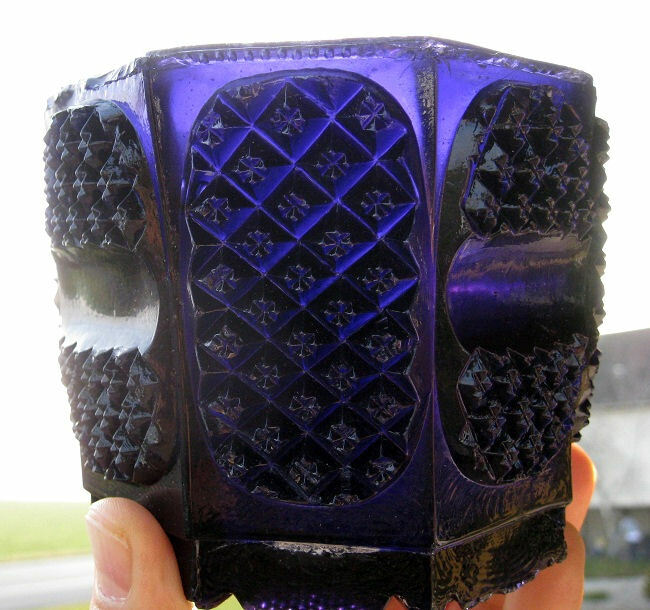 Note the glop-spread wrinkles near the base where the molten glass first hit the mold sides and then spread upward to create crackle type wrinkles. This little cutie is 2-1/4″ tall and is 2″ top diameter. I found this amongst knick-knack clutter in a small antique shop not far from me, begging to be taken home, which I was very much obliged to do. 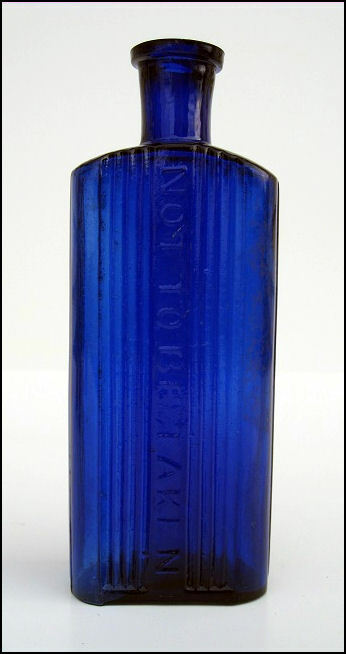 This crudely mold blown NOT TO BE TAKEN English poison bottle isn’t easily had to begin with. But finding is amongst the shelves of all blue items at the local Goodwill was certainly not a common occurence. I never expected to see a collectible poison bottle at a Goodwill, especially at the price I snagged this one for. I never cease to be surprised by pickin’. This is an 1830-40 Giant Sawtooth patterned whale oil lamp. This piece is also crudely wafer stemmed and pasted together, top and base. A very heavy piece of leaded glass. I would attribute this to early Pittsburgh. Stands 9-3/4″ high. This piece reminds me of a ‘weapon’ in the boardgame Clue. Yes, it was the butler; it happened in the study, and he did it with the pointy, heavy, whale oil lamp. 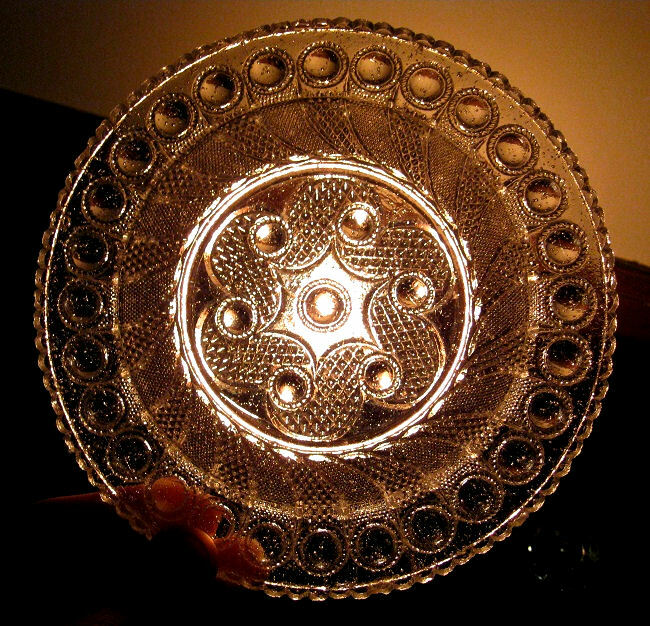 A glass company named Pairpoint reproduced many early classic cup plates in the 20th Century, which always made me wary of acquiring them. A cup plate was for setting one’s non-handled teacup on after having tipped it to pour hot tea into the upward curved bowl-like saucer, both made of porcelain. This was how tea was enjoyed in the early 1830’s as the tea cooled in the bowl-like saucer and was sipped from there. I came across this 3-5/8″ diameter beauty by simply going through a stack of reproductions sitting on a flea market table and was quite surprised to see the real thing amongst them. The pattern is unknown to me and the pineapple motifs have me leaning towards the maker being Boston & Sandwich Glassworks and they were known for patterns featuring pineapples. Note the busy patterned edge, this was done on purpose as it helps blend and hide fleabites and chippage the maker knew would happen eventually from use. This piece is thick, heavy and pressed a bit off center, not to mention when tapped it rings like a bell. A very nice score. 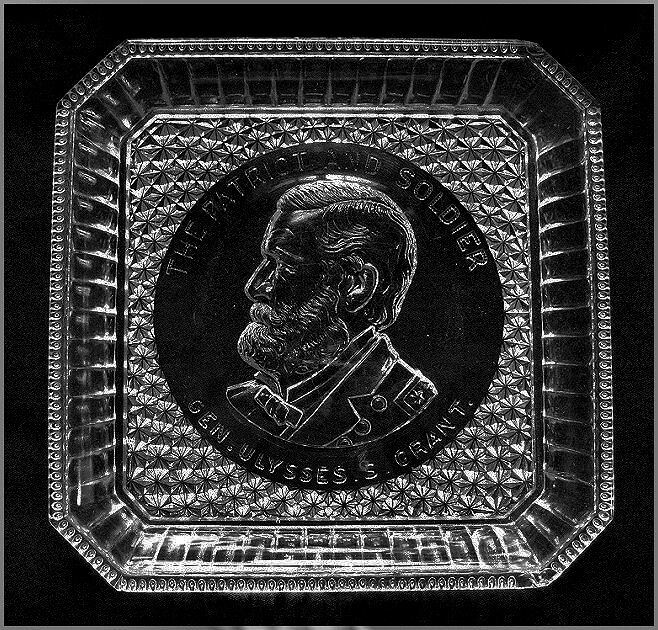 This large square 9-3/8″ x 1-1/2″ high beautiful pressed glass bread tray was a made upon Grant’s death in 1885. He was the 18th President, having served 2 terms from 1869-1877. 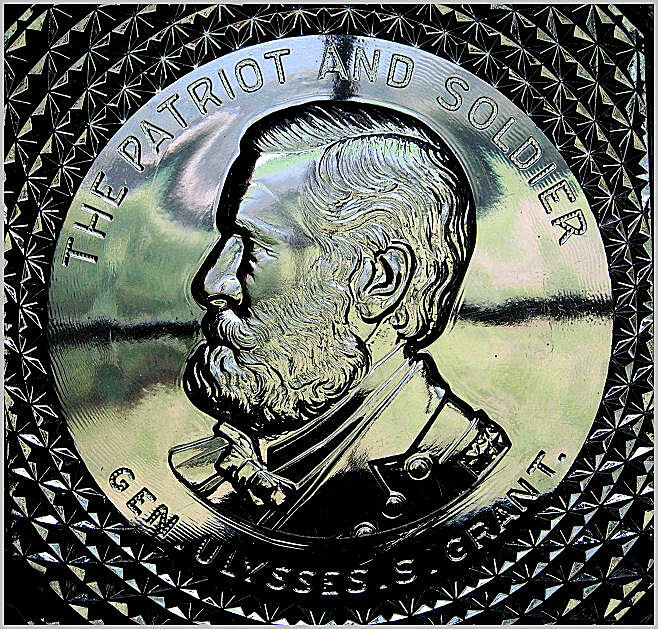 He was responsible for the defeat of the Confederate forces and the end of the Civil War. This beautiful piece was made by Bryce Higbee & Co of Pittsburgh, Pa. I found it on a table at a local flea market. It was filled with old auto maps that were mostly concealing it. I instantly noticed the characteristics of an 1800’s piece of glass just by the busy edge made with the purpose of concealing nicks or chips. I lifted the maps to see this beauty. I was very delighted when the Gal behind the table told me “Everything on the table is $1.00.” I pulled a dollar out of my pocket like a gunslinger doing a fast draw. The portrait is beautifully done. These are very old and primitive yet elegant for their time. 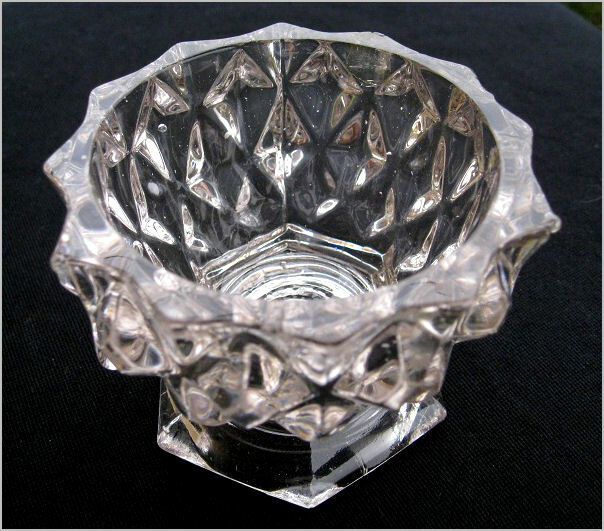 These are heavy pressed flint glass bowls featuring the Roman Rosette early pattern. The top sides are smooth, all the mold pattern is on their base sides. 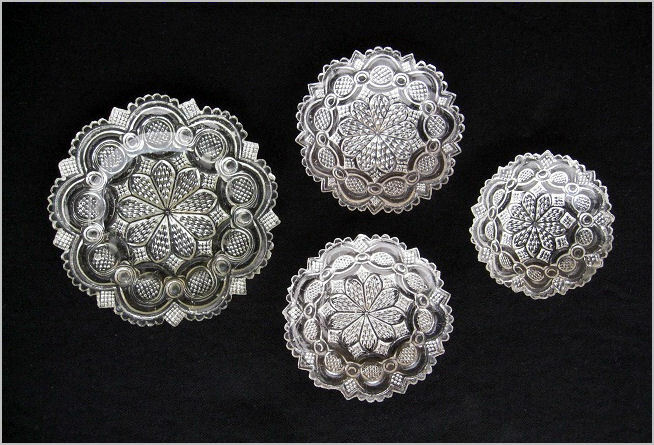 The plate is 5-1/2″ and the bowls are 4″ with the smallest one being 3-1/2″. I pick these up whenever I see them, which is not too often. Note the very busy pattern type, often referred to as “Lacy.” Also note the very busy edges, made to hide future chippage. Balanced on the heel of your thumb, and flicked, these ring like bells. 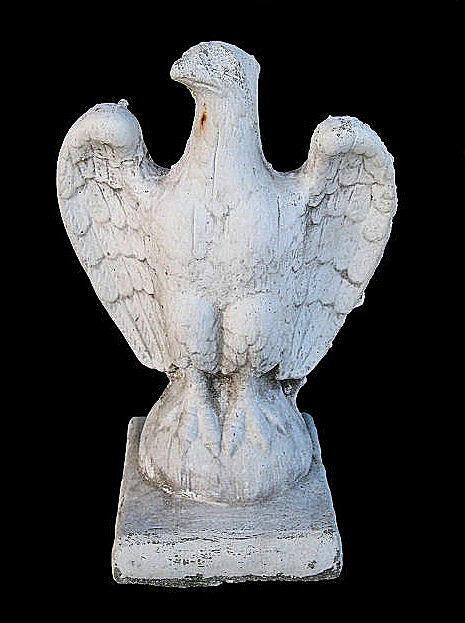 The most fascinating coincidence when acquiring this very old c1890-1930 unique cast concrete garden or cemetery eagle statue still boggles my mind. I had seen it in a local antique store not five miles from me back in the summer of 2011 and absolutely loved it. All original paint, great old patina. Very heavy and big; stands 17″ high and 10″ across. Yet a tad pricey; I was hesitant to pull the trigger on the deal. It wasn’t very easy to spot where it was displayed, but it had definitely caught my eye. (Note the missing eye, right along a seam line where it caught on the mold upon removal.) Then, one Sunday in early September, I was redecorating my kitchen and had just the place for it. Off to the store I went, knowing for sure it wouldn’t be there as that’s almost always the case. I was surprised and relieved to find it still sitting there, as if waiting patiently for me. Unable to haggle the price down as it was a consigned piece and not the owners; I began writing a check and asked what’s today’s date. The answer was 9/11. I thought wow, how cool, buying an antique American Eagle on such a significant day. While I was thinking wow, the store owner actually said “Wow,” out loud and handed me the sun and rain faded price tag that had the consignor’s item number which you could just barely make out: #911. It doesn’t always have to be about glass. This is a classic example of something being so bad it’s good. 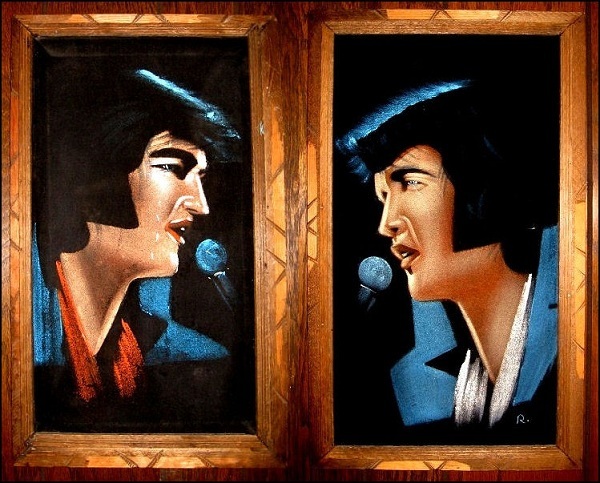 Talk about tacky with a capital ‘T.’ I was in a thrifty shop nearby and apparently someone had brought in Elvis memorabilia from their attic. 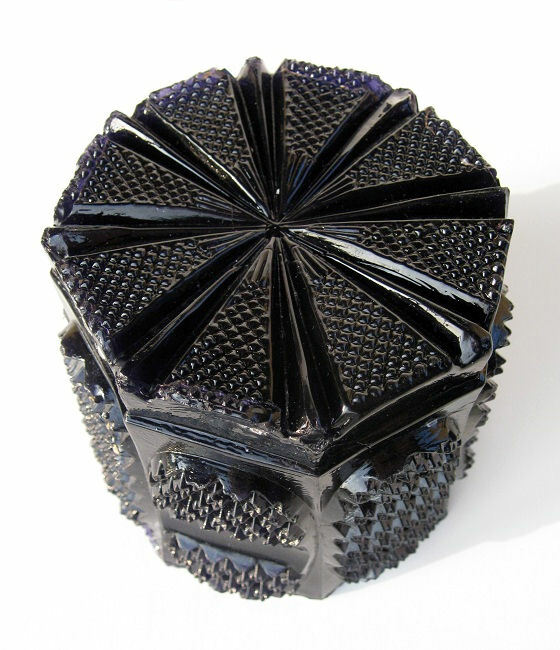 These are large and measure some 22″ high by 13″ across. They were priced at $40.00 for the pair. Seeing I was the only one in the store and noting there was no line outside the door waiting to come to buy these, I haggled them down to 20 clams for the pair. These go on eBay for $40 each, but I wasn’t even it them for the money, I just couldn’t leave them there. They were linty, but a little masking tape cleaned them up like new. There’s always a place for the unusual or, even these, here at the farmhouse. Just great old Americana, even if they were Hecho en Mexico. This is a favorite pattern of mine, and not easily found. 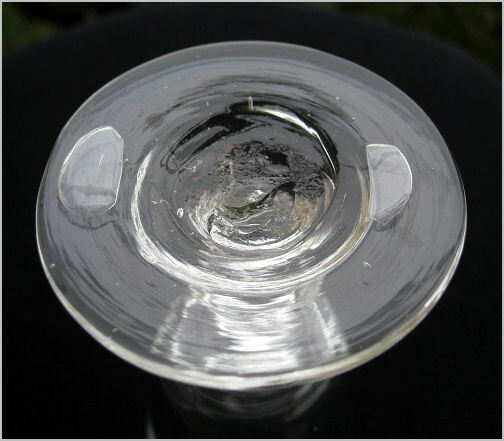 This is one old flint bowl; note the amount of bubbles, so many that it gives the glass a silvery appearance. This is a very early 1820′s Boston & Sandwich piece. This Peacock Feather pattern influenced many pattern styles for a long time and evolved to a much later (1890′s) similar pattern called Peacock Feather, or ‘Georgia,’ (which nobody calls it.) This bowl’s a good size and is just over 6″ across. I hope to find more examples of this amazing pattern. Note the detail, the teeny mold cut diamonds in every other tail or feather, it’s a wonder the mold maker didn’t go blind. For more info and comparisons, see my December 2012 article Two Old Peacocks Still Struttin’ Their Feathers. This is the elegant way to keep one’s Scotch, Whiskey, or Brandy. 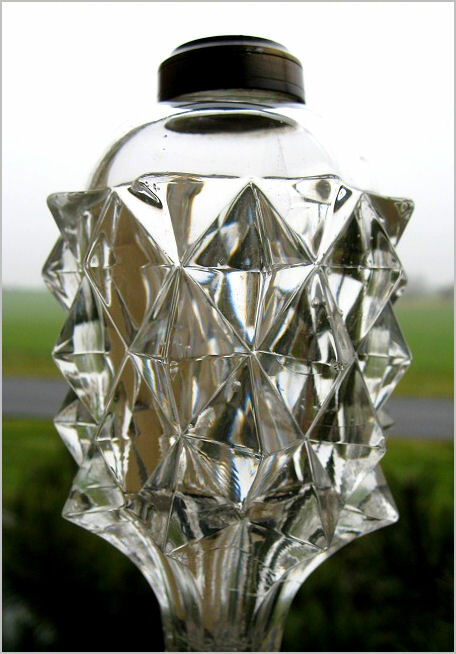 The decanter is mold blown up to the pattern end, then it’s all free blown from there. 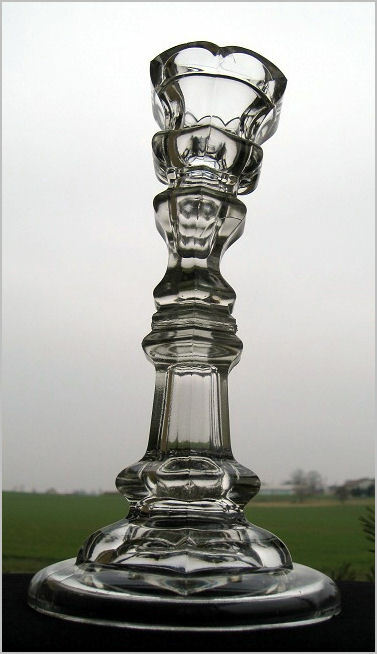 The base has a polished pontil. The stopper is quite impressive, it’s hollow mold blown and it’s base is pontiled. The Sawteeth are smaller than the ‘Giant’ Sawtooth pattern and note the very distinctive scalloped type base which is very distinctive of Boston & Sandwich. (See my front page article Now It Can Be Told: The Decanter That Almost Came With Divorce Papers for a extremely similar Boston & Sandwich Horn of Plenty decanter in an extremely rare Canary Yellow. Save for the pattern and color the make is identical.) 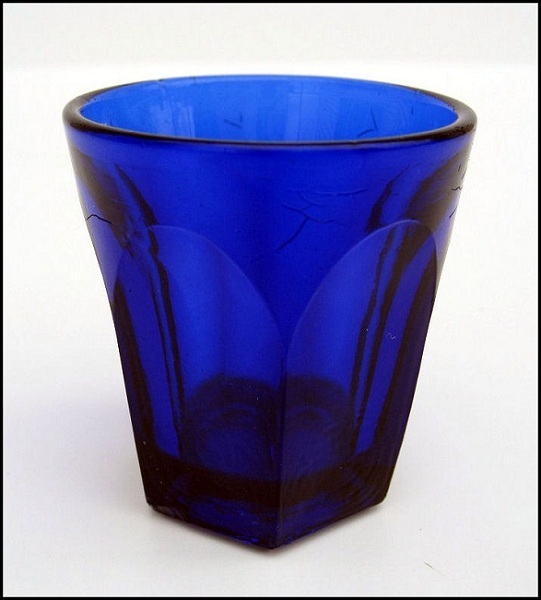 The tumbler dates to the same era, may be Boston & Sandwich, or, from another Glasshouse as this pattern was popular during that era. A nice pair that I actually use, especially in the winter. Salt was a very valuable commodity in those early days of the 19th Century. The head of the household had, of course, the largest salt dish of which an example is featured above. Again, note the elegance of the piece contrasting with the primitiveness of the open ring pontil on the base. This piece is likely Boston & Sandwich, but could possibly be an early Pittsburgh Glasshouse in origin.